(Newser) – (Spoilers follow.) Amazon's Transparent is coming to a close, and it's now been revealed what will happen to Maura Pfefferman, played by ousted actor Jeffrey Tambor. Per the Los Angeles Times, the transgender character will be killed off in the series finale, a move that was widely rumored after Tambor was fired from the show last year amid sexual misconduct allegations. "It was clear that saying goodbye to Maura was our path forward," show creator Jill Soloway says in a statement, per CNN. "In this musical finale, we dramatize the death of Maura in an odyssey of comedy and melancholy told through the joyful prism of melody and dance." I can't believe I read this article. I can't believe I'm now commenting. Clearly, it's time for me to turn off the computer. 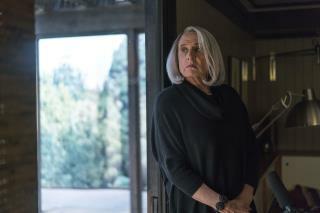 Fate of Tambor's Transparent Character: 'It Was Clear'. Oh, I see what you did there.-Ray Charles. Tambor is better looking as a woman ? ?